It’s Taz here – I’m from Newcastle upon Tyne in the North East of England. 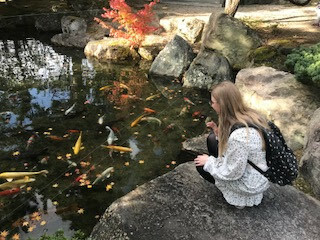 I have been in Japan for about 4 months now and I am really enjoying it here! …and once I got to the top. It was very quiet going up – I only saw 1 other person as I was climbing the mountain and, once I got to the top, I saw another 4 or 5 people. I enjoyed the sights so much that I decided to go up Mount Taikazan again the following week, but this time I wanted to see the sunset from the top, so I decided to drive up. I drove up and enjoyed the peaceful view at the top of the mountain, again taking lots of pictures. The weather is a bit colder now but I hope to climb up again in the Spring, as I think it will be beautiful in a different way! ....and I'm here to tell you all about my first month living here in Shunan, Japan. When I first arrived into Tokuyama train station I was tired, confused, and a little worse for wear! I had just spent the last 42 hours travelling all the way from Manchester in England to a very rainy Japan, and all I could think about was having a hot shower, drinking a cup of coffee and going to sleep. But before I tell you about all of that, here's a little information about myself. I am 24 years old (as of November 11th) and I was born and raised in Rotherham, England. I am the youngest in my family and I have been living in York in England for the last five years. I studied Psychology at York St. John University and I have a slight obsession with shoes! When I first told my family and friends that I wanted to move to Japan they asked me why. Why? There are many reasons that made me want to come to Japan, I love the people, I love the culture, I love the scenery and most important of all...I love the food! But enough about me, take a look at what I have done in my first few weeks of being here. Hopefully as you can see by my photos I have already explored some of the things to do in the Yamaguchi prefecture. I highly recommend driving through the mountains at this time of year as the changing of the leaves is simply breathtaking. Here we drove for around 40 minutes where we found two amazing cafe's out in the woods. We drank hot chocolate, ate food and admired the views. 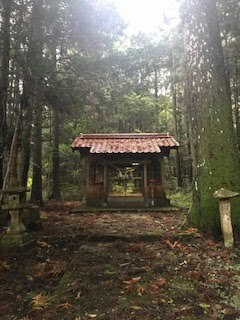 This was a cool semi-abandoned shrine that we found on a short walk from one cafe to the next. Part of my job involves teaching in a few different locations, one of which is in Hikari city. Hikari is about a 20 minute drive from my house in Shunan and has a really quiet beach where you can enjoy watching the waves roll in and letting the world pass you by. I am looking forward to spending more time here when the weather is nice and warm! 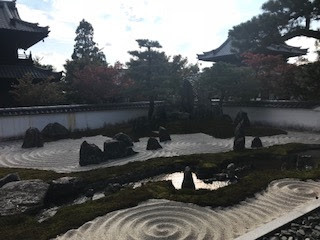 Last weekend I went to visit the Kanyo-ji Temple which is a 45 minute drive from Shunan centre and is in such a beautiful location. We explored the Temple for only 300 yen and enjoyed the peace and quiet when we were there. After visiting the Temple we walked around Kanokami and went to a few more shrines before heading home for the day. I highly recommend that you come here in Autumn as the views in the Temple and around the mountains are spectacular. 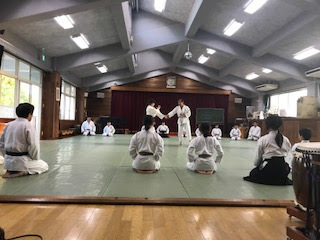 I went to observe an Aikido lesson during my spare time on Sunday. It was amazing to see everyone perform the moves and work together. It was a very good experience and I enjoyed watching the class. I am hoping to join an adult Aikido class at some point this year so stay tuned! And finally here's a photo of me! My students threw me a lovely surprise Birthday party with cake and presents, topped off with this amazing decoration! 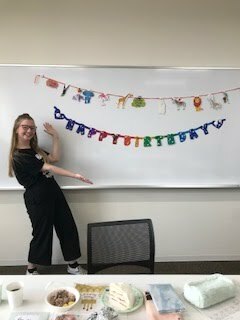 It was such an amazing gesture and I can't wait to continue my teaching journey here in Japan!